Best Parking App - It'll find available parking options based on your arrival and departure information. The Westin hotel is in the "Seaport District". There are parking garages on the Red Line at Alewife (MBTA station garage, $7 per day, $8 overnight) and at Park Street (Boston Common Garage, $11 per weekend day (including holidays), if you arrive after 4pm on Friday and leave before Tuesday). Wellington Station (Orange Line) has a parking lot ($5.50 per day, 1,000+ parking spaces, no overnight parking). There are overnight parking lots in Braintree, Framingham, Woburn, and Peabody. available for people that take the Logan Express bus the airport (round trip bus ticket is $22, parking is $11 per day). Also, parking at Logan Airport ranges from $18-$24 per day. From the airport, it's a short hop on the Silver Line to the hotel. MBTA Alert: On Saturday and Sunday, Red Line service between Alewife and Harvard Square will be replaced with bus service. For details, see the MBTA web site. Parking in the garage under the Westin Boston Waterfront is $43 for Valet Parking per day for overnight stays, self-parking is $33 per night. With just 400 parking spaces in the garage, we're expecting it to sell out (8 spaces are reserved for handicap parking and three are reserved for hybrid parking). The garage is not operated by the hotel, so we are unable to make any adjustments in parking rates. There are other parking lots nearby that range from $10 (new day begins at 3am) to $12 until Midnight and $24 (if you stay past Midnight). There are parking meters in the area. Most meters are 8am-8pm, a few are 8am-6pm. All meters are free on Sundays and Holidays (i.e. MLKjr Holiday)). 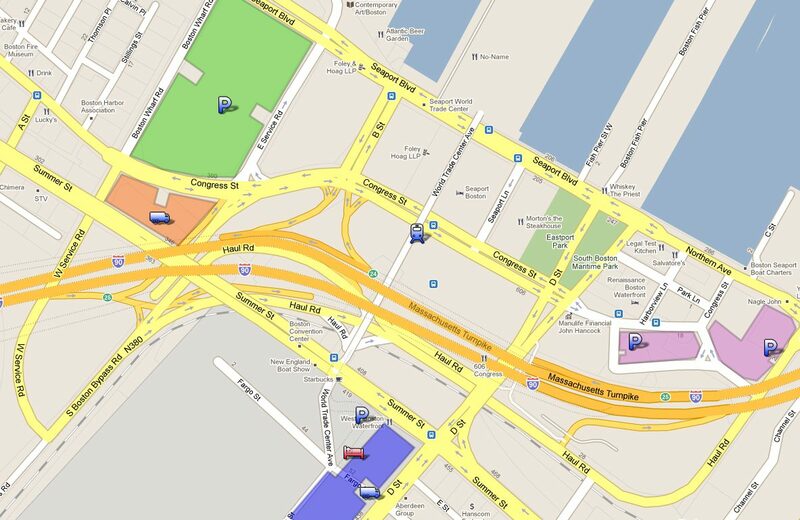 For a rough idea of where the meters are, take a look at the Primo Parking site. You can park your car for the weekend at LAZ's 390 Congress St. Lot (green on the map below) for $26 per day (or $13 for the first 19 hours). The entrances for the lot are on E. Service Rd and at Boston Wharf Rd. You pay when you exit. MassPort's lots are marked in pink on the map below (directions are below). From Monday to Friday, hourly parking is $5 for less than 2 hours and $10 for 2-4 hours. The max rate is $28 ($20 if you arrive 6pm). On Saturday and Sunday, it's $5 for less than 2 hours and the max rate is $10. Rates reset at 3am. No overnight parking during snow emergencies (cars will be towed). About 1/2 mile from the hotel is a parking lot on Necco St with rates that vary from $6 (weekends) to $12 per day. To get to the LAZ parking lot at 390 Congress St. Lot (marked in green on the map above), continue down Summer St past the Westin and turn left onto D Street. After the bridge (third traffic light), turn left onto Congress St, go about three blocks and turn bear right onto E. Service Rd. The entrance to the parking lot will be on your left. To get to the closest MassPort parking lot (marked in pink on the map above), continue down Summer St past the Westin and turn left onto D Street. After the bridge (second traffic light), turn right onto Congress St, and then turn right again (just before the parking lot) and then turn left into the parking lot. Parking at the Logan airport garages is $24 per day. The Economy Lot is $18 per day. From the airport, you can take the Silver line back to the hotel. If you have a vehicle that won't fit in the parking garage., you can park overnight at one of LAZ's parking lots. If your vehicle is too tall, you can park at the 390 Congress St. Lot. If your vehicle is too large to fit in a single parking space (a truck or a car with a trailer), you can park at 391 Congress St. Lot (marked in orange on the map above), but you'll need to go to the entrance to LAZ's 390 Congress St. Lot and pay the attendant there and have him let you into the 391 lot (you'll be charged for two parking spaces). If you arrive after 11pm, their 24-hour attendant can be reached at 1 (617) 451-7732 and he should be over in minutes to let you in. The rate is $24 per space per 24 hours. To get to the parking lots from the loading docks, turn left from Fargo Street onto D Street. After the bridge (third traffic light), turn left onto Congress St, go about three blocks and turn right onto E. Service Rd. The entrance to the parking lot will be on your left. If you need to get to the oversize lot, continue down E. Service Rd (stop outside the entrance to the 390 parking lot on your left to pay for parking at the 391 lot) , turn left at Seaport Blvd, and then left again onto Congress St., the entrance to the lot will be on your right (there's a median strip down the middle of Congress St, so you can't turn left into the oversize lot).